What happens when you cook zucchini and then you make it cheesy? Winner winner – zucchini dinner! Pan-roasted sweet corn adds texture, color and taste to salads. Check out cookitquick.org for a quick and simple way to make this tasty salad! 1. Sweat the eggplant. “Sweating” an eggplant means to get out any bitterness that may have developed by making it sweat. Begin by peeling and slicing the eggplants into 1/4 inch thick slices. Sprinkle 2 teaspoons of salt over all of the slices of eggplant – be sure to salt both sides. Set the salted, sliced eggplant into a colander and let it rest for about 30 minutes.After 30 minutes, the eggplant should begin to sweat (droplets of moisture being extracted by salt). Rinse the eggplant, remove from the colander and place the slices on a paper towel. Place a second paper towel on top to reomove all the excess moisture that has formed. 2. Put 2 tbs of olive oil in a pan and warm. Place the eggplant slices in the pan and cook about 5 minutes on one side. Flip and cook the other side for another 5-7 minutes. The eggplant should be fork tender when done cooking. 3. Serve and enjoy! We ate ours plain last night, but you could find any number of things to top the eggplant with like spaghetti sauce and mozzarella or a greek yogurt dressing. The hot summer sun has been brutal on our tender vegetables – and our people too. We’ve had as much sun and blistering heat this year as any year since we’ve began growing vegetables. We’ve gone to an earlier start in the mornings to try to avoid some of the heat for the people. But, in this constant sun, plants and vegetables can literally become sunburned and dryout, especially in a greenhouse or high tunnel, where all of the moisture is coming from drip irrigation near the root system. So, almost a month ago I told you that we put shade cloth on the greenhouse. It’s been great to have that reprieve from the sun in the greenhouse. Shade cloth is a simple knit or woven fabric designed to reduce the amount of sun that reaches the vegetable bed. Although shade cloths come in many colors, materials, and thicknesses, our shade cloth is a nice black woven mesh. And as of this week, we have put shade cloth on the remaining 5 high tunnels. It’s the first time these tunnels have had shade cloth and we were amazed at how quickly it went on. This week we’ve also been working hard to get more plants in the field. We planted nearly 12,500 plants in a single day. Whew! We were thankful to get some good planting conditions with just a little moisture in the ground from the last 0.30 in of rain. We’ve also spent a large amount of time harvesting this week. The zucchini, yellow squash, and cucumbers need to be harvested nearly every day. It looks like the tomato production may start to pick up soon, but they’ve been pretty slow for so far. We’ve got a few crops this week that haven’t been in the CSA yet this year. Although most of you have probably seen these vegetables before, this may be the first time many of you are cooking eggplants. Here’s a big tip: Before cooking the eggplant, be sure to “sweat” the eggplant. “Sweating” an eggplant means to get out any bitterness that may have developed by making it sweat. Begin by slicing the eggplants into 1/4 inch thick slices and liberally sprinkle salt on both sides. Set the salted, sliced eggplant into a colander and let it rest for about 30 minutes. After 30 minutes, the eggplant should begin to sweat (droplets of moisture being extracted by salt). Rinse the eggplant. Then remove the excess moisture before cooking. There are many of recipes out there, so pick one to enjoy or check out what I made for supper last night on pekareksproduce.wordpress.com. 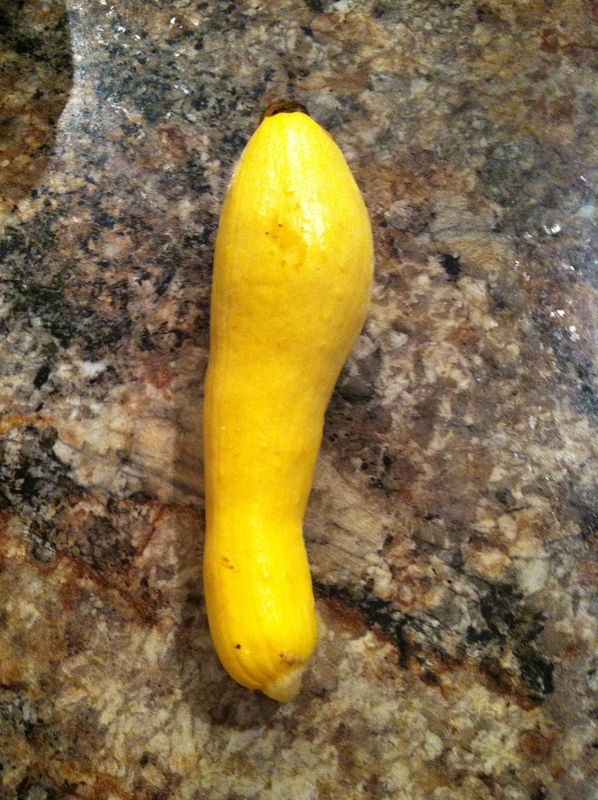 We love simple sautéed yellow squash. Just a little olive oil with salt and pepper. Every once in a while something happens on the farm, that it makes everything else pale in comparison. This week just such a thing happened. We spend much of our time picking and harvesting produce. Usually this means that we harvest things like zucchini and squash by picking them and then putting them into a bucket before bringing them back to the packing shed to be cleaned up and packed. This year we purchased a conveyor to cut out a couple steps. We attached the conveyor to the tractor and now instead of picking one bucket at a time, we are able to place the squash and zucchini on the conveyor which takes it from where we are picking up to a person on the hayrack behind the tractor. The person on the tractor cleans them and packs them right away. This week was the first time we have used the conveyor. It was wonderful! We can pick multiple rows at a time and don’t have to haul heavy buckets of produce all over the world. Vegetable production is looking pretty good around here this week. We are getting a nice harvest of pickling cucumbers, so if you are interested in getting a half bushel or more of pickling cucumbers, give us a call. Sweet corn is coming along nicely. We plant several times throughout the year, so we expect to have a supply that continues for quite some time. Kohlrabi are doing great and we just picked the first couple of cantaloupe for the season this week. There weren’t very many out there yet, but the ones that are were delicious. Try your hand at the delicious salad from cookitquick.org. Its a simple recipe that makes 4 side-salad servings. Drain the corn and immediately plunge it into ice water to stop the cooking process and cool it. Either proceed with the rest of the recipe now or, I like to pat the ear of corn dry with a clean paper towel, wrap it in plastic wrap, store overnight in the refrigerator and then proceed with this recipe the next day. Cut the kernels off close to the cob; some kernels can be left clinging together to add extra interest to the appearance of the salad. Combine all salad ingredients in a medium-sized bowl. Whisk together dressing ingredients and mix with salad. If time allows, chill the salad for about an hour for flavors to blend. However, the salad tasted good when eaten immediately, too! It seems there are a hundred different ways to cook sweet corn and hopefully everyone has at least one favorite method! When we do cook sweet corn, we most commonly boil it. Here’s our very simple recipe. Bring water to a rolling boil. Place cleaned sweet corn in the boiling water for 6 minutes. After 6 mnutes shut off the heat to the water and let corn sit in the hot water for 3 more minutes. Remove corn from the water, eat and enjoy! The rain also gave Ryan a couple minutes to pause. Ryan’s daily routine usually begins around 5:30 or 6:00 in the morning and ends around 9:00 or 10:00 pm with paperwork. The crew shows up at either 6:00 am or 7:00 am depending on the forecast for the day. The hotter the weather, the sooner we need to be in the field so that the young crew isn’t in the heat in the middle of the afternoon. We have so many people and so much action on the farm this time of year that instead of a doorknob on the door to the mudroom, we currently have a towel stuffed in the hole where the knob should be because the knob got tired and gave up. The greenhouse is full! Every little bit of bench space is covered by trays of plants, mostly cabbage, broccoli, and kohlrabi. We have a couple of hayracks of fully grown cabbage plants that are ready to be transplanted. There’s another bunch of watermelon and cantaloupe plants that need to get in the field this week and onto plastic. We started picking pickling cucumbers this week. They are delicious! There’s not very many yet this week, but in just a couple of weeks we will have enough for to start pickling. We also started picking sweetcorn just yesterday. The first batch was picked late morning, we ate several ears raw, and then cooked up some more for lunch. If you are looking for ideas on how to use your produce this week, be sure to check out the blog at CookItQuick.org. Alice Henneman is a food and nutrition Extension Educator with the University of Nebraska who is also using our weekly CSA. Each week she uses the produce from the box and shares a series of photos and recipes on cookitquick.org. If you haven’t seen it yet, be sure to check it out.